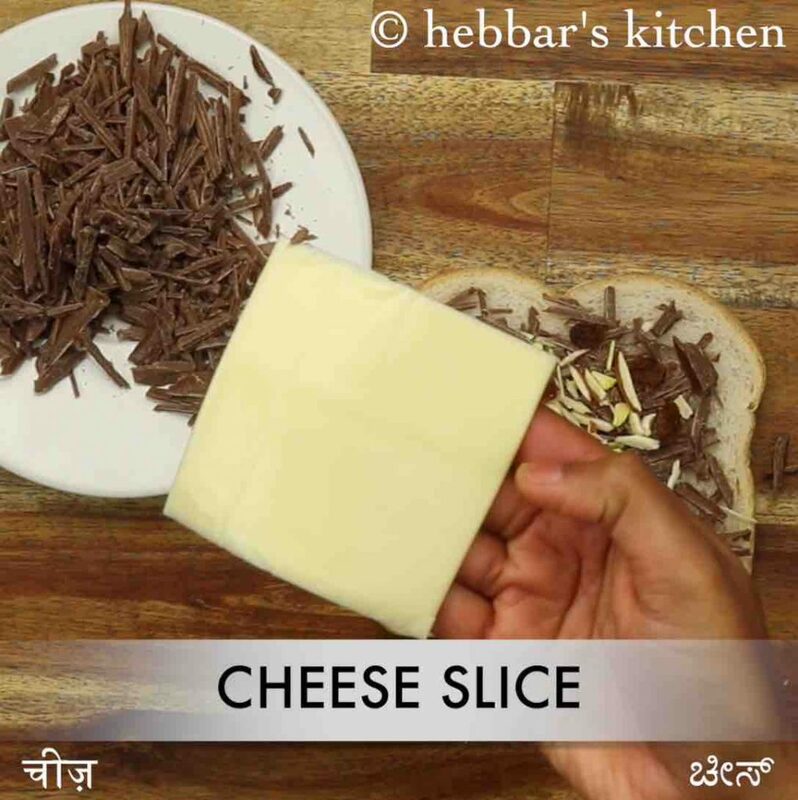 chocolate sandwich recipe | chocolate cheese sandwich | grilled choco sandwich with detailed photo and video recipe. 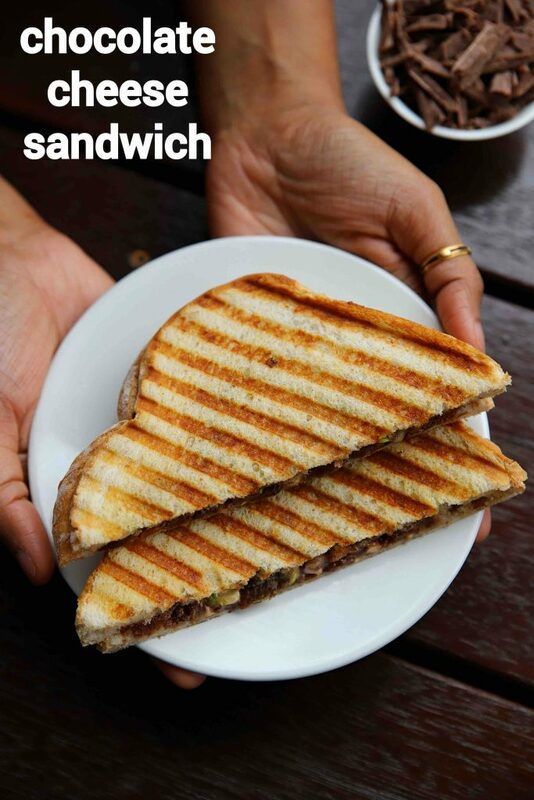 a fusion recipe of sandwich made with bread slices with melted chocolate stuffing. it is typically served as a dessert and not consumed for breakfast or as a snack like other sandwich recipes. it is easy and simple dessert to make it as it only requires white bread slices, grated chocolate and cheese slice. 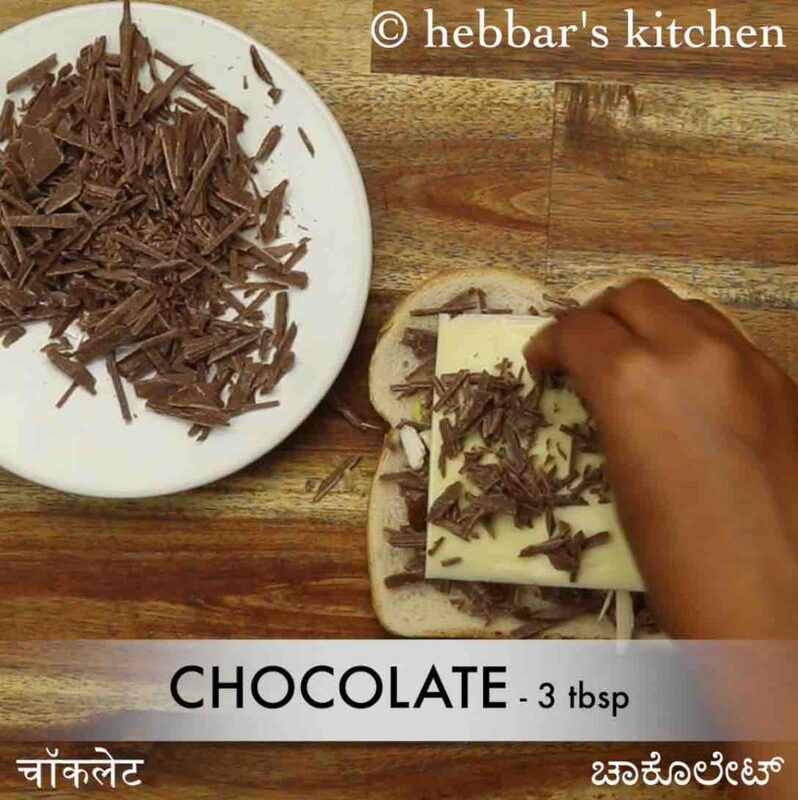 chocolate sandwich recipe | chocolate cheese sandwich | grilled choco sandwich with step by step photo and video recipe. 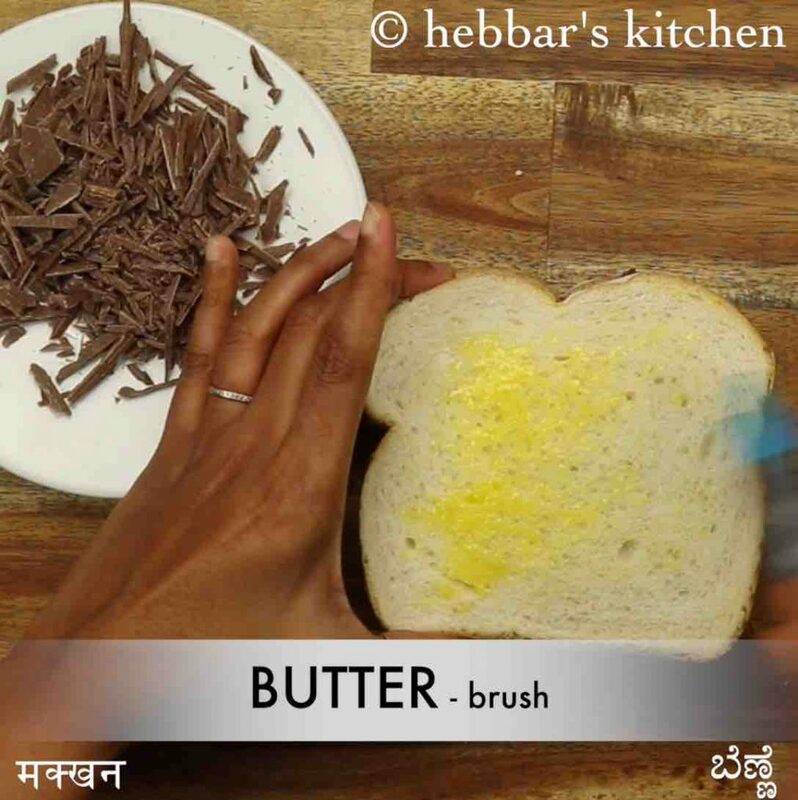 sandwich recipes are very common these days across india. 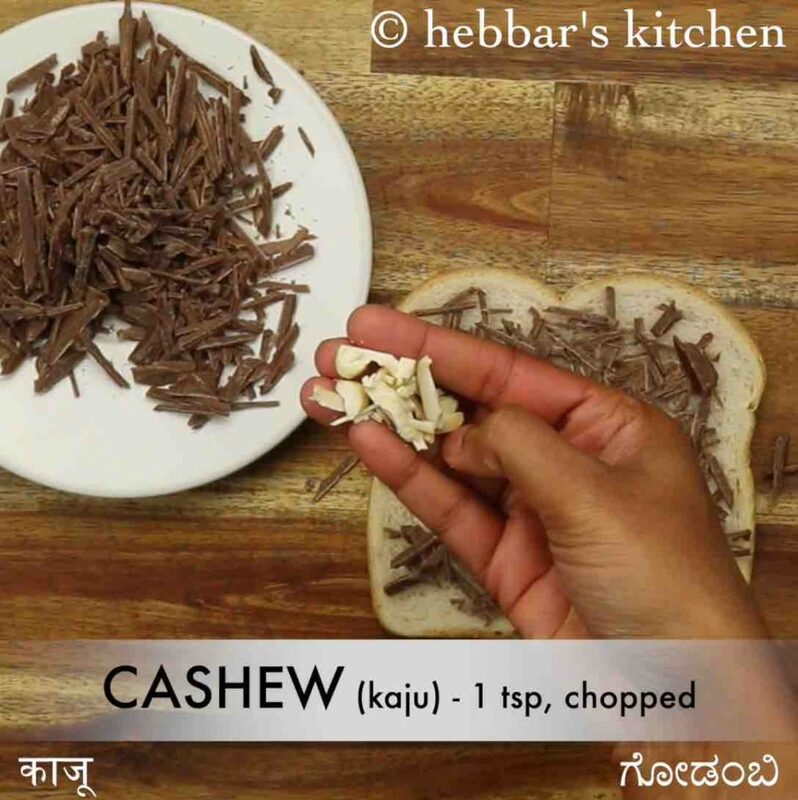 it is made for a various purpose, particularly for breakfast and as an evening snack. 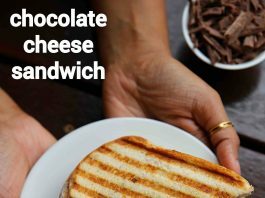 but then there is a sandwich recipe made with chocolate and served as dessert. it is a popular urban dessert snack served in many cafe’s and appreciated by young generations. 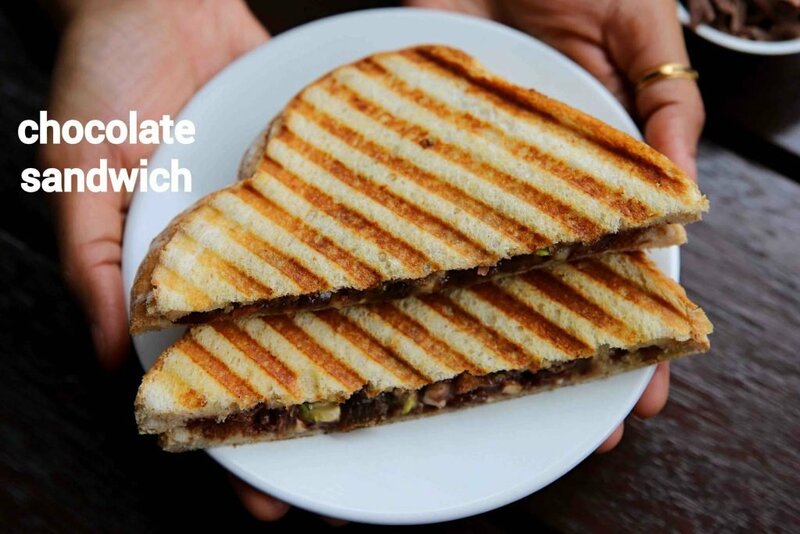 well the concept of chocolate sandwich by itself may be confusing and amusing for many. the word sandwich is almost synonyms to savoury with spice stuffing inside 2 bread slices. however, that is not true and there are quite a few sandwich recipes made as dessert with myriad dessert stuffing. in this recipe post, i have used chopped chocolate with cheese slice which makes it a classic dessert recipe. i personally like to make these sandwich with leftover sandwich bread slices. moreover, it is an ideal dessert to surprise your guest when you do not have much time to serve them. furthermore, i would like to add some tips, suggestions and variations to the chocolate sandwich recipe. firstly, i would heavily recommend using white sandwich slices to make these sandwiches. 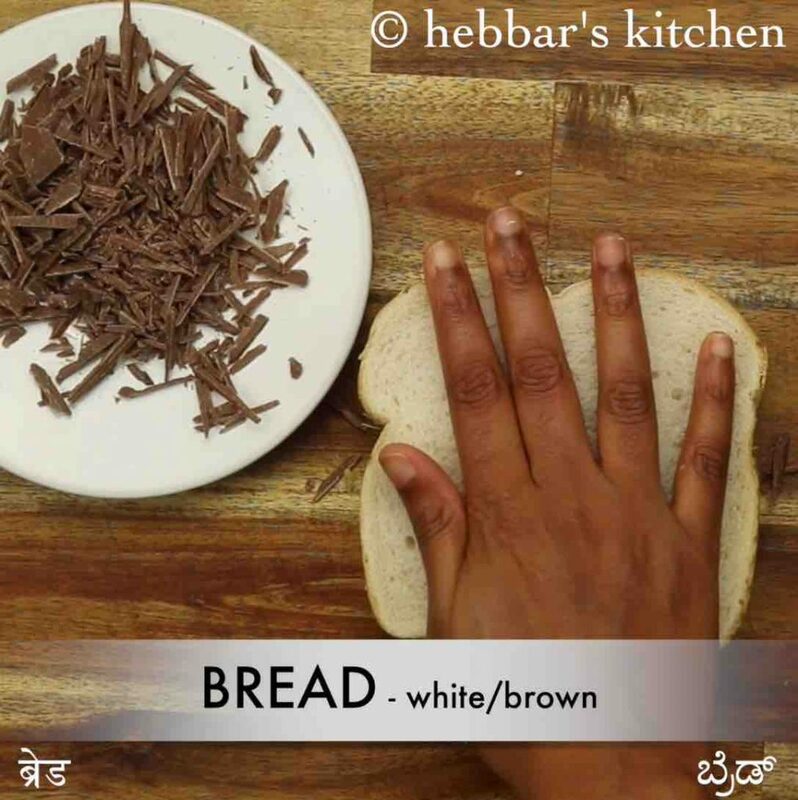 you may perhaps use the multigrain or even brown bread, but you may not get the same taste like white bread. secondly, you can use any type of chocolate and it is completely open-ended. i have used milk brown chocolate which makes it perfect for this recipe. but you are more than welcome use milk or dark chocolate as your taste preference. lastly, you can easily grill with a sandwich grill or even on tawa. sandwich grill should provide even heat and is most recommended. firstly, chop chocolate into small pieces. you can alternatively use chocolate sauce. 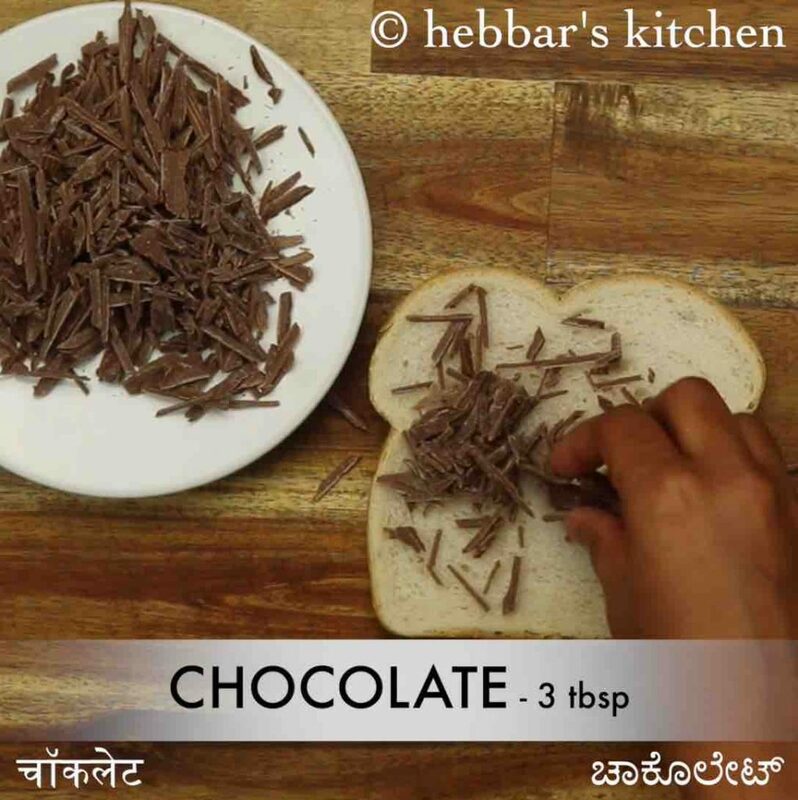 spread 3 tbsp of chocolate pieces over bread slice. top with 1 tsp cashew, 1 tsp pistachios, 1 tsp almonds and 1 tsp raisins. place a cheese slice over it. again top with 1 tsp cashew, 1 tsp pistachios, 1 tsp almonds and 1 tsp raisins. further, cover with a bread slice and press gently. spread butter over bread and grill golden. finally, cut half and enjoy chocolate sandwich recipe. 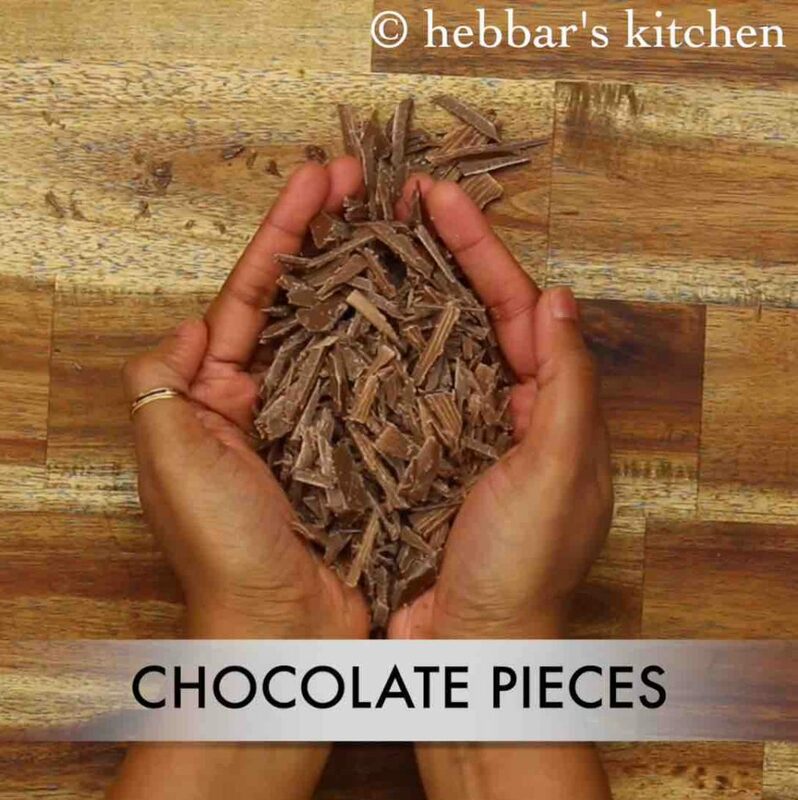 firstly, chop chocolate into small pieces. you can alternatively use chocolate sauce. again top with 3 tbsp chocolate, 1 tsp cashew, 1 tsp pistachios, 1 tsp almonds and 1 tsp raisins. spread butter over bread and grill golden. you can toast on tawa as well. firstly, stuff generous amount of chocolate or chocolate sauce to make it tastier. also, if you are using chocolate with nuts then you can skip adding nuts. additionally, after grilling top with a generous amount of chocolate sauce and serve. finally, chocolate sandwich recipe tastes great when served hot.